I always said that Marie Antoinette was a chick flick. Some boys just don't get what girls get out of shopping. But I did find it significant that given all her choices last Friday night, 17-year-old Nora chose The Departed. That was first on her list. And she and her friends came out of it besotted with Leo. Which they've been since Titanic, but now he's a 31-year-old adult man. 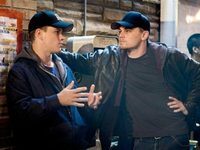 And could well earn an Oscar nom for The Departed. Martin Scorsese vs. Sofia Coppola? Leo and Matt and Jack and Mark vs. Kirsten and Jason? No contest, even for a girl who, trust me, LOVES shopping. 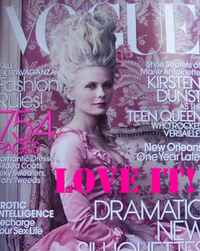 On the other hand, my friend Cheryl the interior designer had orgasms watching Marie Antoinette. She was blissed out for days thinking about the delicate bead work on those evening gowns.